Kerney accounted for 24 sacks and 127 tackles in college and was selected by the Atlanta Falcons in the first round of the 1999 NFL draft (30th overall). He had a quiet rookie season with 2.5 sacks. Kerney moved into the starting lineup in 2000, compiling just another 2.5 sacks in 16 games. He broke out with a team-leading 12 sacks in 2001 and followed up with 10.5 in ’02. 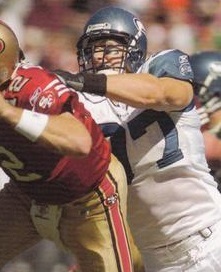 Kerney spent five more seasons with Atlanta, achieving Pro Bowl recognition in 2004, before departing to Seattle as a free agent in 2007. Seahawks went 10-6 to finish first in the NFC West. Won NFC Wild Card playoff over Washington Redskins (35-14). Lost NFC Divisional playoff to Green Bay Packers (42-20). Kerney was limited to seven games, and five sacks, in 2008 due to shoulder problems that required surgery. He retired following the 2009 season due to further shoulder issues. Over the course of 11 seasons, Kerney registered 82.5 sacks, 24.5 while with the Seahawks. He received first-team All-NFL recognition once from the Associated Press, and second-team honors once, and was a two-time Pro Bowl choice.